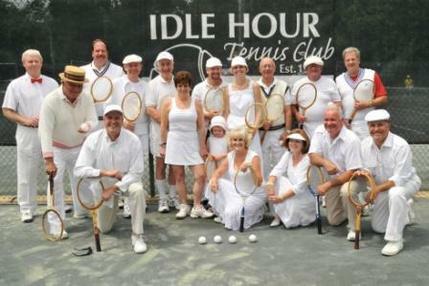 A history of over a hundred years is impossible to sum up in a few paragraphs, so we suggest that if you are interested in the eventful history of Idle Hour tennis club, scroll to the bottom of the page to read the attached software version of the book. Hard copies are available to members at the pro shop. The club was founded in 1911 in West Philadelphia by a small group of men and in a few years attracted two hundred members. In 1928, forced to vacate its Milbourne site, just West of 63rd and Market Streets, the club moved to its present site on State Road and Route 1, bordering on Darby Creek. During many financial ups and downs, the club’s existence was often threatened. Thanks to the dedication and hard work of the club’s leaders and members, Idle Hour made it into the more prosperous post War War II period. The list of people who contributed to founding, sustaining and promoting the club is impressive. Rather than providing specific names in this summary, we suggest that you follow the link below to the full history of the club. There you will be able to read about these dedicated men and women and the many things they have done for the club. The modern period of the club, because of its proximity is filled with many details and interesting photographs of the people who lead the club and the members who contributed to its success. How the club went from its modest membership of 140 to 400 and even beyond that to its recent numbers exceeding 500 involved many twists and turns. Well-considered decisions by leaders whose only interest was the furthering of the club’s fortunes contributed. A dedicated membership, many of whom have made the club their regular Spring through Fall tennis home, also made this possible.